Perfect for kids ages 3-6, this activity book will get little ones discovering amazing everyday science as they play their way through 14 exciting experiments found inside. 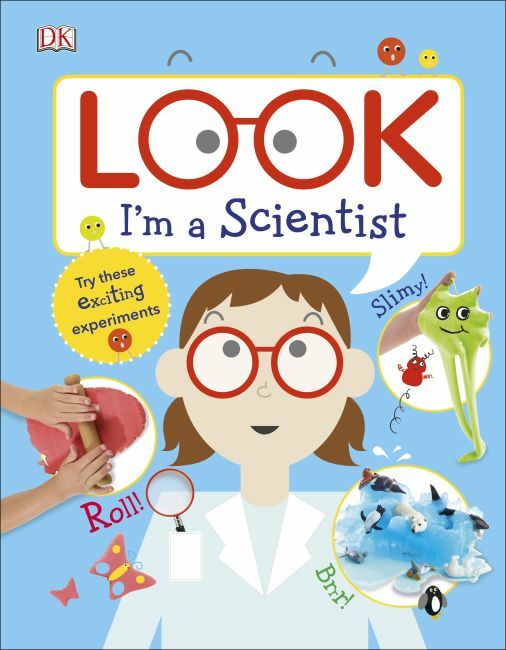 Look I'm a Scientist is bursting with fun hands-on learning experiences that will get children playing, discovering amazing everyday science, and excited to try the experiments again and again. The 14 activities are easy to prepare, set up, and create, and visual step-by-step instructions and a charming design make it the perfect STEM activity book for parents and their little ones to share. From an iceberg animal rescue to stretchy slime and a science wizard potion, kids can pour it, mix it, feel it, and more, as each sensory-friendly activity becomes an ever-so-exciting science experiment. Little ones have the ability to look, touch, smell, taste, hear, and, above all, play their way to scientific discovery and amazement with Look I'm a Scientist. Being a little scientist has never been so much fun. Series Overview: DK's Look series of exciting and educational STEM books focuses on the sensory experience of practical learning and play, and finds the science in everyday activities. Hands-on learning experiences tap straight into kids' insatiable curiosity and sense of wonder. Perfect for children ages 3-6 and formatted with a padded cover and toddler-tough pages, the series encourages children to develop independence, and improves their critical thinking, investigation skills, and motor skills as they play their way to scientific discovery and amazement.